Consuming the trendy new snack, sold at mall kiosks and some fairs, makes very appealing videos on YouTube and Snapchat and Instagram — and can result in great pain and damage. Teens! They’re so great at finding innovative ways to cause bodily harm. First they were eating Tide Pods, then they were jumping out of moving vehicles to dance to the new Drake song, or giving themselves frostbite by spraying an entire can of deodorant on their skin. And now they’re eating Dragon’s Breath, a snack made with liquid nitrogen that can burn your mouth or cause respiratory distress if ingested incorrectly. It should not surprise you to learn the teens are ingesting it incorrectly. Dragon’s Breath gets its name because the snack can make a diner breathe “smoke” – condensed moisture from your own breath – out of both their nose and mouth. It makes very appealing videos on YouTube and Snapchat and Instagram! Sold at mall kiosks across America, it’s made by pouring liquid nitrogen over a snack food, such as cheese puffs or sugary cereal, which freezes it instantly to a very cold temperature, typically around negative-320 degrees Fahrenheit. It’s the same stuff that’s used to make Dippin’ Dots. Purchasers are advised to eat the snack with a stick, not their fingers, and to blow on it several times to let the liquid nitrogen evaporate. That’s because, when a person’s skin or tissue comes into contact with liquid nitrogen, according to the South Florida Sun-Sentinel, it “can cause serious burns to skin, cause deadly asphyxiation if inhaled, and it can damage sight if it splashes or gets rubbed into the eyes.” Shops that sell it post warnings, but they are not always heeded. 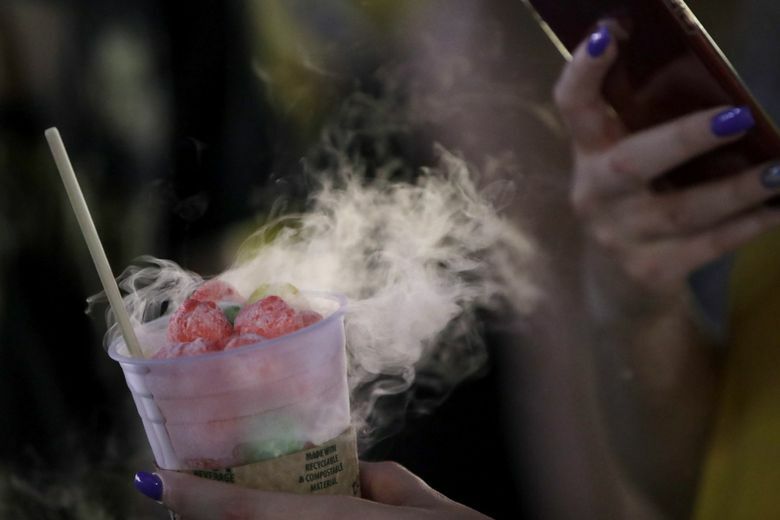 In October, a 14-year-old girl was sent to the hospital after touching the liquid nitrogen in the snack at the Pensacola Interstate Fair in Florida. In late July, a mother in St. Augustine, Florida, took her son to the ER after the Dragon’s Breath triggered a massive asthma attack. Inside Edition spoke with a young man who inadvertently burned the inside of his mouth until it bled. Other injuries may be minor, like the ones reported all across Twitter: “My tongue still hurts,” wrote @xentyler. “The roof of my mouth is numb from eating these and I’m pretty sure I froze off my taste buds” wrote @beettoo__. Twitter user @sammolner1 posted a photo of her bleeding tongue. Surprisingly, we have José Andrés, Michelin-starred chef and humanitarian, to thank for Dragon’s Breath. He served a highbrow version of it made with caramel popcorn at the Bazaar, his Los Angeles restaurant, until 2009, and he has also served a version of the dish at Minibar in Washington, D.C.
Maybe that’s because the clientele at Bazaar and Minibar is primarily adult. If you or your thrill-seeking teen decides to try Dragon’s Breath, remember: Don’t touch the liquid in the cup, use a utensil to pick up the snack, let the nitrogen evaporate and eat slowly. Or maybe just avoid the whole thing altogether.